Drone System From Zipline To Launch In Tanzania, Delivering Medical Supplies : Goats and Soda Drones have delivered everything from pizza to condoms to hot dogs. In Tanzania, they have a bold new mission. A Zipline drone is launched in Rwanda. The company is now expanding to set up a national network in Tanzania. Eight-year-old boy bitten by dog. Two-year-old child with severe anemia. Mother, age 24, bleeding severely at childbirth. Entries like these popped up as Keller Rinaudo browsed a database of health emergencies during a 2014 visit to Tanzania. It was "a lightbulb moment," says the CEO and co-founder of the California drone startup Zipline. Rinaudo was visiting a scientist at Ifakara Health Institute who had created the database to track nationwide medical emergencies. Using cellphones, health workers would send a text message whenever a patient needed blood or other critical supplies. Trouble is, while the system collected real-time information about dying patients, the east African country's rough terrain and poor supply chain often kept them from getting timely help. "We were essentially looking at a database of death," Rinaudo says. That Tanzania trip motivated his company to spend the next three years building what they envisioned as "the other half of that system — where you know a patient is having a medical emergency and can immediately send the product needed to save that person's life," Rinaudo says. 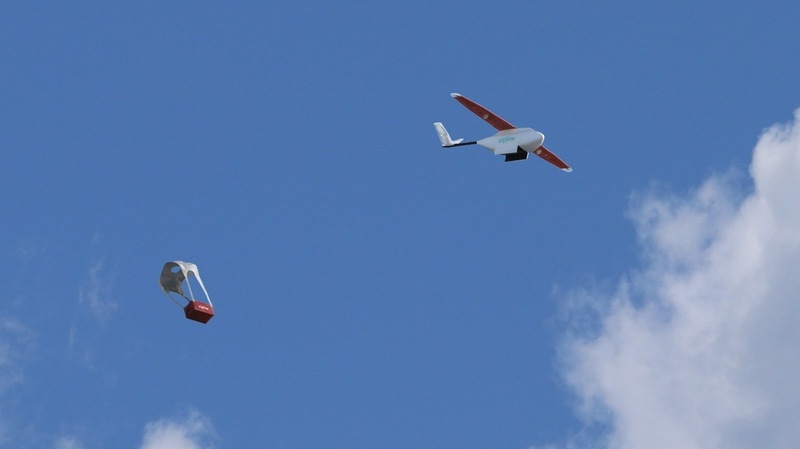 Today the story comes full circle as Tanzania's government makes a special announcement: In early 2018, the nation will start using Zipline drones for on-demand delivery of blood, vaccines, medications and other supplies such as sutures and IV tubes. Last fall, Zipline deployed 15 drones serving 21 clinics from a single base in a smaller neighboring country, Rwanda. 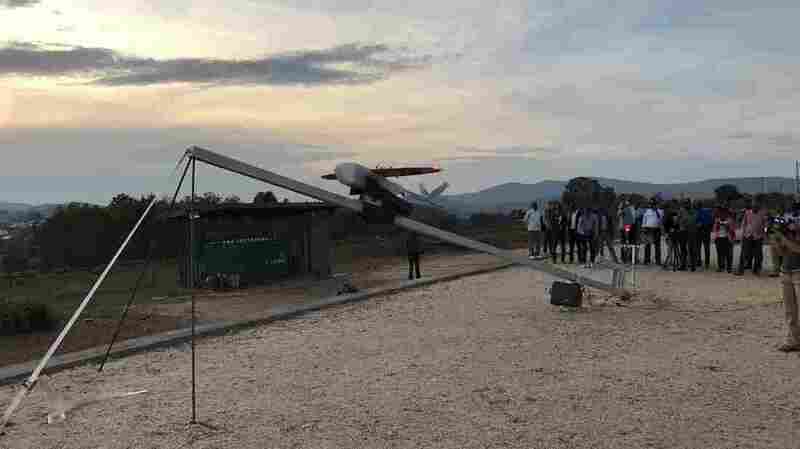 The delivery operation planned for Tanzania would be the world's largest — 120 drones at four bases serving more than 10 million people at 1,000 clinics across the country. Zipline's 30-pound electric drones fly 68 mph to health centers up to 50 miles away. The drone service costs about the same amount as delivery using traditional road vehicles, says Rinaudo, a Harvard graduate who built DNA computers inside human cells and constructed a rock-climbing wall in a dorm basement before setting his focus on drones. Tanzania's drone delivery service, in partnership with the country's ministry of health, is set to launch in its capital city, Dodoma, in January. Three more distribution centers will be added in the country's northwestern corner and Southern Highlands later in the year. Drones have delivered everything from pizza to condoms to hot dogs. Yet many of these publicized efforts are single fair-weather flights from point A to point B. "What Zipline is doing is operating a network at national scale," Rinaudo says. "We have to fly far and fast... do it in any weather, day in and day out, and be capable of hundreds of deliveries a day." Even among drone health care initiatives in Africa, "there's more smoke than fire," says Timothy Amukele, a pathologist who studies health care-related drone delivery at Johns Hopkins University School of Medicine. "Zipline is the only drone company with a delivery program that's integrated with a national health system." Drones fly through the sky on a delivery in Rwanda. Here's how the system works. Zipline has hired locals to operate its drones and run the distribution centers, which stock blood products and medical supplies. After a hospital places an order, a worker packs the products into a shoebox-sized container and loads it onto a drone, which zips to the hospital, drops the box by parachute and flies back to the distribution center, where a worker swaps out its batteries and loads a new package. In five minutes the drone can take off again, enabling each center to launch up to 500 flights per day. With the drone network, deliveries that would typically take up to eight hours by road can happen in under a half-hour. Still, Zipline's drone delivery fleet doesn't cover all clinical transport. Its vehicles make one-way flights with deliveries from a central hub to remote hospitals but do not do pickups. Pickups require the capability to land, and that introduces complications — untrained people loading the drone, and kids or animals in the area that could be hurt by a drone landing. Yet "two-way services are what's actually needed for clinical care," says Amukele, who heads clinical pathology labs at Johns Hopkins' Bayview Medical Center. Rinaudo agrees that transport of diagnostic lab samples is "a huge need — and something we definitely plan to serve in the future." Delivering emergency supplies and picking up diagnostic test samples require aircraft with different capabilities, says Jeff Street, a drone engineer and pilot. "If a drone can make pickups, it can also do deliveries, but not all delivery drones can also make pickups." Street and Amukele have shown that unmanned aircraft can safely ship a range of clinical specimens and recently set a new distance record for medical drone transport — a three-hour flight carrying human blood samples across 161 miles of Arizona desert. For now, Rinaudo considers Zipline's drone networks a major victory — not just for his company but for Rwanda, and soon Tanzania. The locals on the operations team are "phenomenally smart, ambitious and driven. They work 12 hours a day, seven days a week. They will do anything to save human lives," says Rinaudo. "Rwanda showed what's possible when you make a national commitment to expand health-care access with drones." Other countries, even the U.S., are taking note. In addition to its Africa initiatives, Zipline is trying to bring drone delivery service to rural U.S. communities and Native American reservations. "Most people think of new, advanced technology starting in the U.S. and trickling down to Africa," he says. "This is a total overturning of that paradigm." Esther Landhuis is a freelance science journalist in the San Francisco Bay Area. Follow her @elandhuis.